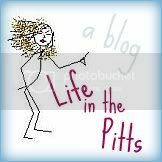 Life in the Pitts: I want to make my mark on the world. Even if it's just a little mark, in a tiny corner. I want to make my mark on the world. Even if it's just a little mark, in a tiny corner. Hi guys, I am participating in the SITS Get Back to Blogging event. Today's prompt: Why Do You Blog? I write because it makes me happy. It's an incredible creative outlet. And I love to make you laugh. I've never been good at keeping a journal. I've tried a few times, but I never get more than 9 pages down before I lose it, or start using it as a paperweight. There are so many things I wish I could go back and read about- but I can't, because I was too lazy to write. This is one of my biggest regrets. Blogging serves so many purposes. It's a way for my family to know what's going on in my life (although sometimes that backfires). It is a way to reach out and connect with people (when I am alone in an office all day, this makes a really big difference). It's an exercise in introspection, and a motive for observation. It's an awesome way to drive Kurt crazy. And it just makes me feel good. Back to the journaling thing for a moment. My mom didn't keep many journals. What I wouldn't give to be able to read about her as a teenager, or a first time mother. I'll never get the chance to ask her about these things. If she had written them down, I would be able to read her words and get to know her in more than an irritated daughter/exasperated mother relationship. But she didn't, and I can't. I hope I live longer than she did. I hope I get to see my kids graduate high school, and get married. And I would love meet my grandkids. But if I don't, I want to leave my words behind. I want my children to read them. I want them to get to know their mom. Not a glowing, perfected memory (who would speak ill of the dead? ), but a realistic look at my flaws and my quirks and all the things that make me, me. I want them to smile at my ridiculous titles, and think "Wow, she's just like me!" or "Thank goodness I'm more like dad." I have stories to tell. The little, funny, irritating, normal stories that make up my life. I didn't think so many of you would listen. I don't really know why you do. But whenever I see your smiling faces in the google friend box, or read a thoughtful comment, it inspires me. It keeps me going. You guys, I also write for you. This event is being sponsored by Standards of Excellence,Westar, and Florida Builder Appliances. Found you on Sits today. I too blog for the same reasons you blog...although I do throw in some crafts and recipes once in awhile! :) Hey...it's my blog and it's about me right? Great post! I've also never been good at keeping a journal although I've tried several times. I am so proud of myself for keeping my blog going. I too blog for many reasons, most of the same as you. Anyway, I'm a new follower from Friday blog hop. I'd love for you to stop by. Here from Tara's round up! Just wanted to say hi. I tried to keep a journal several times over the years as well. It never lasted. My blog is the only lasting record I have ever kept, and I love it! 1) I love the name of your blog. 2) I blog for many of the same reasons. 3) If I were near you right now, I would come over and give you a big fat hug. I can't imagine having kids without having my mom around to ask a million and one questions to. I blog to communicate and get feedback on my many thoughts. You know- I've read a lot of these today, but yours was the one that I think touched me the most. This post is awesome Helena. I'm so glad you blog. I really am! I look at it daily, and it always makes me happy. I SO agree with you. I really wish I'd spent more time keeping journals when I was younger. There are certain things I wish I could go back and read about, but I never wrote them down. Thanks for stopping by and following me! Following from Tara's weekend blog hop! Cute blog! Congrats on your blog's anniversary! Following your F'book pg. from Sunday Strollin’. Please return the favor with a “like” for my Facebook page of inspiring messages on family, faith and the human spirit! I found you through Making Friends Blogger Style Blog Hop. I am a new follower.